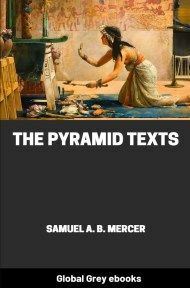 The Pyramid Texts are the oldest texts that have been discovered and Samuel Mercer was the first to produce a complete English translation of this mysterious text. This is Volume 1 of a 4 Volume set. 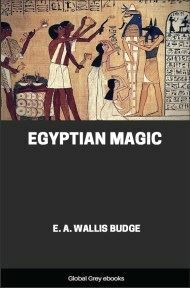 This particular volume, apart from the Preface and Introduction, contains the actual verses of the Pyramid texts. Volumes 2-4 contained all the commentary by Mercer and others, and as of yet, I do not have these books available to put up. Still, this is the one that has all the good stuff in it anyway. 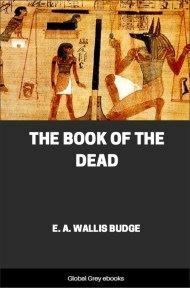 The famous Pyramid Texts herein translated for the first time in English with commentary were found inscribed on the walls of five pyramids at Saḳḳâreh, the ancient necropolis of Memphis in Egypt. These pyramids are those of the kings Unis of the Fifth Dynasty, and Teti, Pepi I, Merenrē‘ and Pepi II of the Sixth Dynasty. 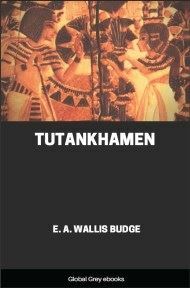 To this translation has been added that of recently discovered additional texts, parallel and complementary, in the pyramids of Oudjebten, Neit, and Apouit, queens of Pepi II, and of Ibi, a king of the Seventh Dynasty, of whom little historically is known. Thus, according to the present generally accepted chronology, these pyramids were constructed, and apparently inscribed, between the years about 2350 to 2175 B.C. It is, however, certain that many of these texts came into existence before the final union of Upper and Lower Egypt, and perhaps long before that date, which is now put at about 3000 B.C. Indeed, some of them possibly existed in oral form before the art of writing was developed. These inscriptions together with others were after that probably written on papyrus and potsherds, many of which in time perished, the rest remaining in various forms until they were collected and incised on the walls of the Saḳḳâreh h pyramids. Evidence of a date previous to about 3000 B.C. is seen in passages which reflect events and conditions previous to the union of the two Lands, for example, the hostility between North and South, before the time of the first king, Menes; in the mode of burying bodies of the dead in the sand; in the pre-civilized era reflected in the so-called Cannibal Hymn; and in the many references to the assembling of the bones of the deceased, passages which indicate a pre-mummification period. And in the historic period various chronological points can be established with fair certainty, such as the time of the Second Dynasty, when both Horus and Set were in favour in royal circles; references to previously written material such as the "Chapter of those who ascend" and the "Chapter of those who raise themselves up," 1245d-e, indicating a time in the historic period in which writing became common; and the formulae for the protection of pyramids, such as, Uts. 600-601, which represent a date after the time of the construction of pyramids. 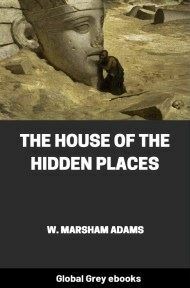 So that the myths and legends, the history and philosophy, the hopes and fears of people (subjects as well as monarchs) of many hundreds of years were finally inscribed in enduring stone, which over four thousand years removed from our time, may now be read with comparative ease and certainty, thanks to the modern discipline of archaeological research and philology. The extent of this written material may be appreciated in saying that it takes well over a thousand pages of two quarto volumes to contain it. In the standard modern edition of the original text, together with parallels and additions from the pyramids of Pepi II, Neit, and others, there are about 7000 lines, most of which are parallels, of more or less completeness of the estimated 2500 lines, which occur in one or other of the pyramids; for most of the utterances occur in more than one pyramid, but very few are repeated in all these pyramids. Thus, the pyramid of Unis has only two hundred and eight utterances out of a total of over seven hundred and thirty; and they with those of the pyramid of Teti are among the oldest in the collection. 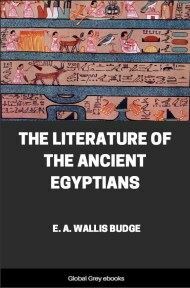 A general idea of the contents of this mass of literary material may be seen in the detailed list of Contents preceding this Introduction; but that does not mean that these texts present a coherent whole, for they do not; and while there are clearly three outstanding elements in them, namely, Solar Theology, Religion and Myths of Osiris, and the Political unification of Upper and Lower Egypt, yet the following seven points may be taken to represent the whole collection with fair general accuracy: 1) A funerary ritual of mortuary offerings, connected with the corporeal reconstitution and resurrection of the deceased king, 2) Magical formulae to ward against harm and evil, 3) A ritual of worship, 4) Religious hymns, 5) Mythical formulae, identifying the deceased king with certain deities, 6) Prayers and petitions on behalf of the deceased king, and 7) The greatness and power of the deceased king in heaven. These pyramid texts were royal texts, and during the Old Kingdom there is no evidence that the people ever took them to themselves and used them in their own tombs. However, at the end of the Sixth Dynasty, Neit, one of the queens of Pepi II, had them applied to herself, though the second person and third person masculine singular were often used and applied to her; but during the Middle Kingdom the use of them spread to the nobles, and in the New Kingdom parts of them were incorporated in the popular Theban Book of the Dead. And doubtless because of their sanctity little attempt was made to put them in accord with changed circumstances. When these small pyramids were built and inscribed the age of the great pyramids, like those at Giza, had passed, and with it the sense of royal security after this life. The great pyramids had been entered in spite of their thousands of tons of masonry, and kings came to look elsewhere for the assurance of a happy and glorious hereafter. They turned to religion and magic. 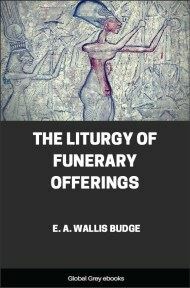 By mortuary offerings and funerary rites the deceased king was armed for his future life; and by magic he was endowed with physical and spiritual power, becoming a great god and associating with the gods, to avoid whatever in the world to come might otherwise compromise his destiny. The purpose of these royal texts then was to guarantee the deceased king's resurrection and new-birth, his transfiguration and divinity, his successful journey to heaven, and his immortality there with the other gods. There in heaven as a great god, sometimes as the greatest of all the, gods, the deceased king was believed to be able to overcome all difficulties by his own might, or by identifying himself with other gods.